Ironing is tedious, hot and requires an ironing board or other sturdy, soft surface. Using a clothes steamer is simpler and can transform ironing into a more pleasant task. Starching a shirt using a clothes steamer is easier than you might think. Place the shirt on a shirt hanger and hang from a clothing rack, coat rack or other hook. Door molding and curtain rods also work, but be careful when working around materials that could be harmed by steam or starch, such as painted walls, wallpaper and certain curtain fabrics. Smooth the shirt with your hands. If it is especially wrinkly, toss the shirt into the dryer on low heat for five minutes. 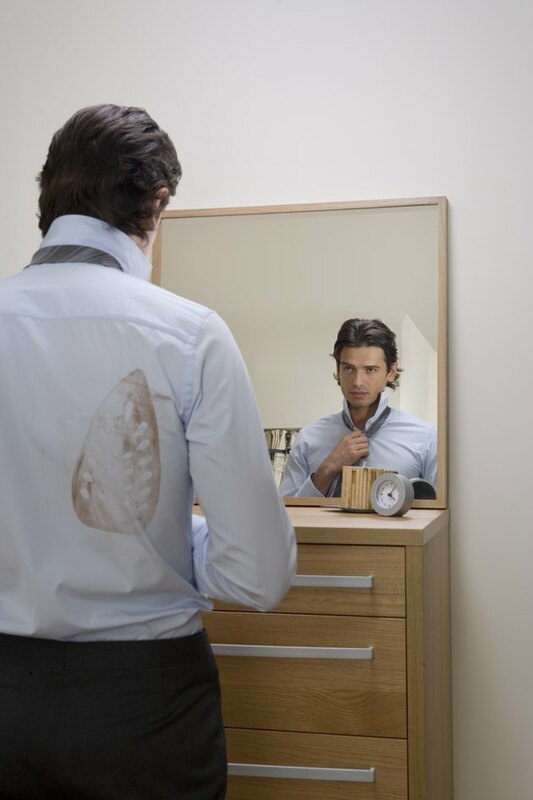 Doing so will smooth the shirt and remove most large wrinkles. Clothes steamers work best on clothing free from deep wrinkles. Turn the steamer onto its hottest setting and set it on a hard even surface, such as a table. While you wait for it to warm up, use a water bottle to lightly mist the shirt. Afterward, run your hands down the shirt and gently tug at the bottom. This will prepare the fabric for the starch. Mist the back of the shirt with light starch. Do not forget about the sleeves. Light starch works better with a clothes steamer, as heavier starches require more intensive ironing. Begin steaming once the steamer is hot and spitting out water occasionally. Hold the steaming wand 1 to 3 inches away from the shirt and move slowly over the material. If you go too quickly, your shirt will not become starchy-crisp. Begin with the shirt's back and then move onto the back of the sleeves. Occasionally tug on the hemline or cuffs as you steam. Turn the shirt and hanger around. Repeat the process on the front of the shirt and sleeves. To steam along the seam lines, lift the sleeves and tug gently on the hem. Leave the shirt hanging until it cools off. This typically takes a few minutes. Hang your shirt in the bathroom as you shower before you starch and steam. The steam from the shower will eliminate large wrinkles. Make your own light spray starch by adding 1 cup of water to 2 teaspoons of cornstarch and pouring into a spray bottle. Read all instructions for your clothes steamer before you use it. Avoid contact with the hot steam, as it can cause severe burns. Read the starch's label to make sure it is safe for your shirt's fabric. Do not add starch to the steamer.